The last thing you want this winter is to be involved in a car accident. With the damage to your car and potential damage to yourself in the process, it can really take the shine off your festive season if you end up on the receiving end of a shunt – or even being the one causing it. One of the main problems with winter driving is that people don’t prepare sufficiently to ensure they are driving safely when the road conditions change. There is also a tendency to continue to drive just as one would on dry roads in sunny conditions. This lack of caution and heed paid to the change in conditions has seen many drivers come a cropper. Preparation is much better than reparation, so make sure you stay on the right side of the road with a little forward planning. Just as you might change your own routine with the change in the seasons, your car also needs different care through the winter months. Many garages offer complimentary or reduced price winter checks to make sure you’re properly set up to tackle the roads when the temperature drops. Making certain that all your fluids are at the right levels and that your tyre tread and pressures are correct can make sure you can see where you’re going and can grip the road. A check for your brakes also ensures that if you do find yourself headed for trouble, you can stop in a timely way. If you’re heading out for a journey in poor winter weather, be it driving rain or snowy conditions, make sure you leave extra time for your trip so you can moderate your pace. Driving at your usual summer speeds isn’t appropriate for the wet and slippery conditions of winter roads, so slow down and take your time as you get from A to B. The police and the Met Office don’t intentionally create alarm, so when they warn of severe conditions it makes sense to pay attention. Heavy rain, snow or ice and high winds can all make for extremely hazardous driving conditions and the police and other agencies want to make sure that you stay safe and don’t end up getting involved in an accident. 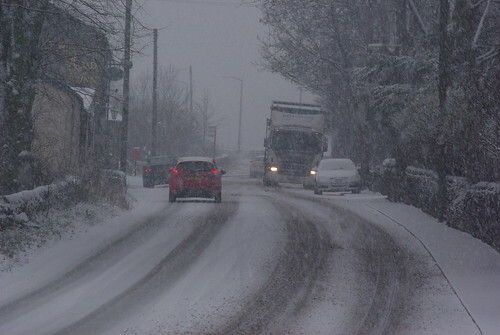 When weather warnings are in force and advice is to avoid travel, unless you have somewhere you absolutely need to be you should follow the guidance and stay off the roads wherever possible. Not only will you keep yourself safe, it reduces the risk of you running into trouble and being sued for someone’s injuries if you end up crashing when you drove against advice. This is a good pointer for many drivers at all times of year but is particularly pertinent in the winter months when the roads offer less grip. You should always keep a safe stopping distance between yourself and the car in front of you when driving, but that safe distance can increase to double or more when the roads are slippery. Measure your distance by marking against a stationary object such as a lamp post. Leave at least three seconds between the car in front of you passing it and reaching it yourself. That way, you have a better chance of stopping if they come to a sudden halt. If you are unfortunate enough to end up injured as a result of a winter collision on the roads you can seek redress. You can make sure you are compensated and receive personal injury claim advice by visiting a number of sites online. However, the best way to make sure you have a safe and healthy winter is to prepare well before taking to the road.